Our Mission is to equip followers of Christ for the work of the ministry according to Ephesians 4:7-16. It is our goal that every member of this church will discover his or her place in the body of Christ and become a contributing force to fulfilling the great commission of our Lord and Savior Jesus Christ. pastor, husband, spiritual father, mentor, lover of hospitality, sober, just, temperate, holy and great Bible teacher. This man is a blessed man. Holding fast to the faithful word. 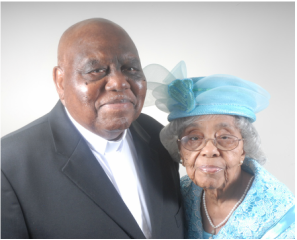 Being a dedicated minister of the gospel required a steadfast, energetic, spirit-filled and loving companion whom he found in his darling wife, Mother Lucille Cheek. She has blessed him with a peaceful home life and seven children. This ministry started in 1968 in his home in Tillery, NC. From his stairways he taught the inspired word of God, always pointing the way to Jesus. Many in his community received Christ; Even whole households were restored and changed!. So impacted is the community spiritually, by Bishop Cheek and this ministry that he has been awarded the "Seventh Annually Community Service Award" by the Weldon-Halifax Community Center. In addition to worship services, this ministry has provided Christian guidance, donations, meeting space, food and clothing distribution, scholarships and support for our senior citizen programs and contributions that have assisted many in our area and world wide. But whose looketh into the perfect law of liberty, and continueth therein, he being not a forgetful hearer but a doer of the work, this man shall be blessed in his deed.